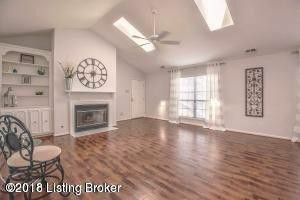 Great location where trendy Germantown meets the Highlands! Quick access to universities, airport, and downtown. Two-to-three bedroom condo with all of the ambiance of the second floor -- cathedral ceiling with skylights plus overlooking fountain and two lakes. Your own garage. The pool in hot weather and fireplace in Winter add to the enjoyment of this large unit with spacious rooms. Master bedroom has two walk-in closets. Year-round Florida Room can be opened or closed and has heat and air. Kitchen is new and has brand new stainless appliances. This one is ready to go!